Difference between revisions of "Letkemann, Peter J. (1886-1966)"
'']] Peter J. Letkemann, minister, teacher and farmer was born 12 August (31 July according to the Russian calendar) 1886 in [[Osterwick|Osterwick]], [[Chortitza Mennonite Settlement (Zaporizhia Oblast, Ukraine)|Chortitza]] Mennonite Settlement, [[Russia|Russia]] to Jacob and Katharina (Harder) Letkemann. In 1908 he married Helena Sawatsky, and after the death of his first wife in 1922, he married Aganetha (Friesen), widow of Johann Penner of Schönhorst, Chortitza Mennonite Settlement. Along with some friends and colleagues, including [[Goerz, Heinrich (1890-1972)|Heinrich Goerz]], Peter took an active interest in religious and historical writings. He contributed to various publications, notably to the book <em>Osterwick 1812-1943</em>, edited by J. J. Neudorf in 1973. "Prediger Peter Letkemann." <em>Der Bote</em> (15 March 1966): 7. Peter J. Letkemann, minister, teacher and farmer was born 12 August (31 July according to the Russian calendar) 1886 in Osterwick, Chortitza Mennonite Settlement, Russia to Jacob and Katharina (Harder) Letkemann. In 1908 he married Helena Sawatsky, and after the death of his first wife in 1922, he married Aganetha (Friesen), widow of Johann Penner of Schönhorst, Chortitza Mennonite Settlement. From 1899 to 1905 Peter attended the Chortitza Zentralschule, receiving his teacher's certificate in 1905. In the same year he was baptized in Osterwick by Aeltester Isaac Dyck. Peter taught elementary school in various communities, including the Russian Mennonite village of Zentral. After his second marriage the family moved to Schönhorst. After the Bolshevik Revolution in 1917, Peter was no longer permitted to teach. He was now obliged to work on a collective farm. In January 1931 he was elected minister in the Schönhorst church although the oppression of the Soviet regime made work in the ministry difficult indeed. As a member of the farm administration he participated in the decision to distribute an extra allowance of rye grain to hungry and needy people in the collective farm. His generosity resulted in a personal denunciation along with four other farm administrators. On 25 August 1932 he was sentenced to five years imprisonment and exile. It is believed that partially as a result of the intervention of friends, including Oberschulze Hans Epp, he was released 1 March 1933. During the period of German occupation (1941-1943), Peter J. Letkemann played a leading role in the establishment of the Mennonite church in the Old Colony. In 1943 he and his family were able to escape from Russia with the retreating German army. In the years 1943-1948 there were many demands for him to serve the various Mennonite churches in Germany because of his ministerial talents. Often he walked more than twenty miles on Saturday to preach and teach in their congregations on Sunday. 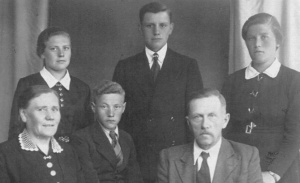 In 1948 the Peter J. Letkemann family immigrated to Canada. Here he served as minister in Morden and Oak Lake, Manitoba. In 1951 he moved to Vancouver and soon after became the minister at the First Mennonite Church. He served this congregation until his death on 25 February 1966. Along with some friends and colleagues, including Heinrich Goerz, Peter took an active interest in religious and historical writings. He contributed to various publications, notably to the book Osterwick 1812-1943, edited by J. J. Neudorf in 1973. "Prediger Peter Letkemann." Der Bote (15 March 1966): 7. Schapansky, Henry. "Letkemann, Peter J. (1886-1966)." Global Anabaptist Mennonite Encyclopedia Online. 2002. Web. 26 Apr 2019. http://gameo.org/index.php?title=Letkemann,_Peter_J._(1886-1966)&oldid=89010. Schapansky, Henry. (2002). Letkemann, Peter J. (1886-1966). Global Anabaptist Mennonite Encyclopedia Online. Retrieved 26 April 2019, from http://gameo.org/index.php?title=Letkemann,_Peter_J._(1886-1966)&oldid=89010.